Dustin and I did some brewing last night... and as we always do we broke out a few bottles of beer to aid in the process. Consider it research, if you will. This time the selections were from Uinta Brewing in Utah. 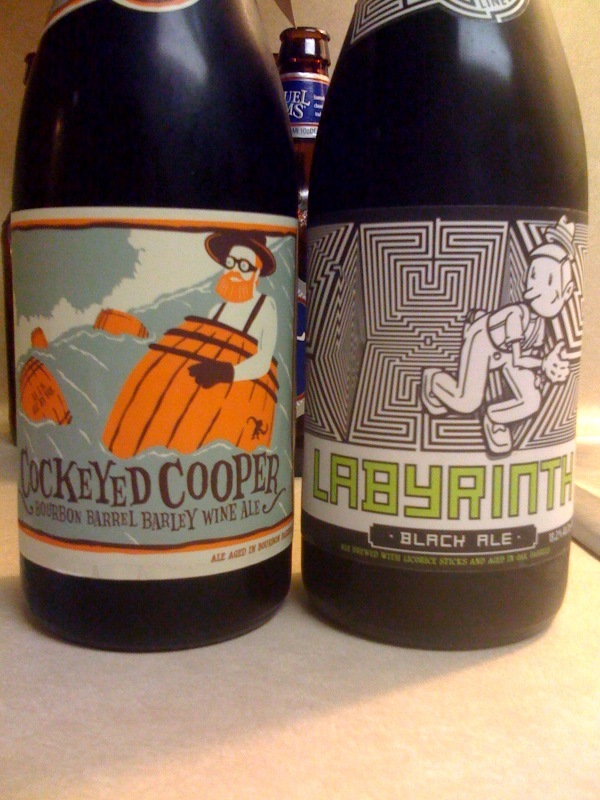 Dustin had been up there to do some skiing before Christmas and brought back a couple of bombers for us... a Cockeyed Cooper (bourbon barrel aged barleywine) and a Labyrinth Black Ale. Yes, strong beer does exist in Utah, it just has to be bought at the state-run liquor stores, I believe. Maybe someone can correct me on that if I'm wrong. I haven't been to Utah since I was 20 and I was kicked out of a liquor store back then for just going in underage, I wasn't even trying to buy anything! Uinta started in 1993, which is relatively old for a US microbrewery, and from what I can tell on their website they are one of the more 'green' breweries around. They can now be found throughout a lot of the West, the East coast, and a few places in between. Not Louisiana though... at least not yet. 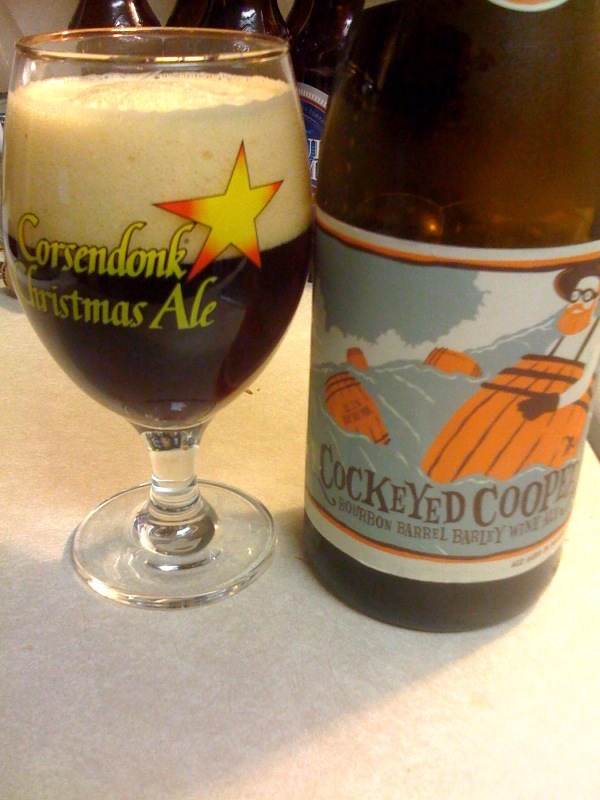 First up was the Cockeyed Cooper Barleywine, aged in bourbon barrels. We broke out a couple of tulip glasses (appropriate for the style) and got to the beer. First note was the beautiful color... the Cooper is a deep red color with a large bubbly head. The head retention and lacing were both fantastic. The smell was first hoppy, with pine aromas coming through the strongest, then a slight hint of bourbon cut through. The taste was a lot more complex, the hops are still there but the bourbon imparted flavors that weren't strong on the nose are much more bold here. The vanilla and caramel from the charred oak are there on the back end of each sip, but the typical alcoholic warmth of bourbon isn't there. It's a very well put together blend, with great balance. This one will soon be added to the 'My Favorite Beers' page as it scored an A+ for me. 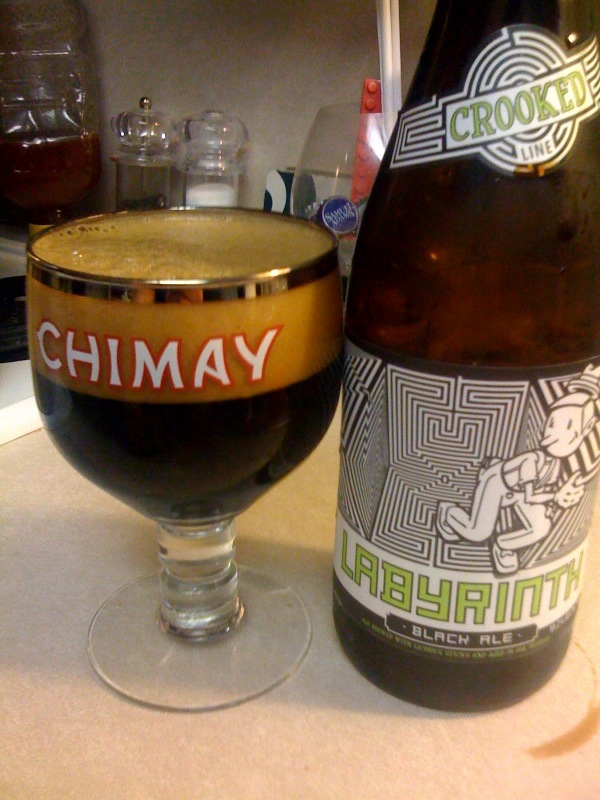 Second up was the Labyrinth Black Ale, which as first I took to be a 'black IPA' or 'Cascadian dark ale' but as I found out on first whiff, it's an imperial stout. The beer pours extremely dark, with a creamy off-white head that went on forever. Just like the Cockeyed Cooper, this is a beautiful beer. The aroma is primarily coffee notes, roasted, with hints of hop bitterness as well. The taste once again surpasses the aroma, just like the barleywine. It's rich, creamy, hits hard of coffee, and it's not overly alcoholic for such a strong beer. The roasted malts come through more on the aftertaste. It has a fantastic mouthfeel, but I'd have a really tough time taking down more than one of these in a sitting... it's actually too rich! 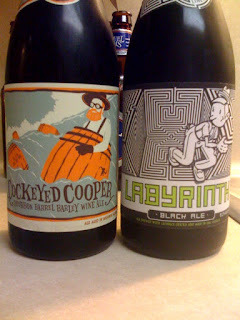 Another really good beer, but I definitely prefer the Cockeyed Cooper Barleywine to the Labyrinth Black Ale. What this really means is that now Dustin and I are going to have to try the other 'Crooked Line' series beers from Uinta, and their other stuff as well if I can find it! We'll have a layover in Salt Lake City to and from Vegas in a week, so maybe they will have some at the airport? We can hope... but until then I'll be closing out 2010 on a good note with two delicious brews. Too bad I didn't wait a couple of days, these could have been the start of my 365 new beers in 2011! Two More Beers From O'Fallon Brewery! Merry Christmas from The BR Beer Scene! Christmas Present #1 - St. Lous Beers! Another Tasty Beer From Fort Collins Brewery. Dec. 10th - National Lager Day! Two Christmas Beers From Ridgeway Brewing. Magic Hat #9 @ The Chimes. Sierra Nevada 30th Anniversary Ale! Saint Arnold Is Coming To BR!